A hostage crisis at the Discovery Channel building has ended with the attacker shot dead, and pundits and reporters are rushing to label him a "radical environmentalist," "eco-terrorist," and "environmental activist." Some are even saying "eco-fascist." And others are pointing to the Earth Liberation Front. For talking heads, it is a good soundbite for pushing their political agenda, and for the press is makes a sexier headline, but the label just doesn't make any sense. James Lee's "radical environmentalism" is a one-man campaign against the Discovery Channel, which airs programs such as Whale Wars" programs that the Japanese have attacked as supporting "eco-terrorists." Lee spent thousands of dollars out of his own pockets advertising his protests, and paid homeless people to attend. His "manifesto," as some are beginning to call it, rails against "parasitic human infants," including "immigration pollution and anchor baby filth." I have been covering the radical environmental movements for over 10 years, and I'm flat-out confused by all of this. Here's why. Lee's "radical environmentalism" is directed at a company that is not the ire of any other animal rights and environmental activists. The Discovery Channel has actually been attacked as promoting radical environmentalism. 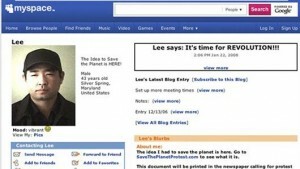 Lee seems to have had no involvement with any environmental groups (aboveground or underground) except his one-man show. Nothing like this has ever happened in the history of the environmental movement. None of it adds up. Yet the mainstream press has been clamoring to say this was a "radical environmentalist" or "eco-terrorist." Is "radical environmentalist" a more acceptable rush judgment than saying someone was insane?Because that's the first, and only, thing that has come to mind in this case. "The Discovery Channel is a big part of the problem, not the solution. Instead of showing successful solutions, their broadcast programs seem to be doing the opposite. Shows like "Cash Cab' and "Dirty Jobs' serve as diversions to keep the focus off what is really important, which is Global Warming and Animal Extinction. Why do they broadcast a show like "Future Weapons" that only promise to destroy the planet even more? And their new lineup "Planet Green" is all about more products and other substandard solutions." I've read countless communiques and justifications by radical groups about their actions, and whether or not you agree with them, you can at least follow some string of reasoning. The target has some connection to the radical beliefs they espouse. In this case? It seems to be the result of personal obsession divorced from reality. Even with far-right extremists murdering abortion-providers, shooting up mosques, bombing black churches, there is some line of reasoning, however thin, that can be threaded between them and their targets. When a white supremacist stormed the Holocaust museum, one can connect the actions to a long line of holocaust denialism in those groups. When an anti-abortion bomber murders doctors, the link is much more direct. When Joe Stack flew a plane into the IRS building in Austin, there was a network of people supporting his actions and decrying the tyranny of taxation. Some call him a hero. So could some of the right-wingers and mainstream reporters covering this please make the same connection in this case? Is there a movement against the Discovery Channel I am unaware of? Are there other eco-terrorists outraged by "Dirty Jobs" and "Future Weapons"? I do not intend to make light of this situation or the fear instilled in those hostages. However, as this issues spirals out of control, could one of these talking heads please stop and help me connect Lee to something, ANYTHING, except the local homeless shelter? [Update: For more, see "James Lee, the Unabomber, and Mental Illness vs. Terrorism"